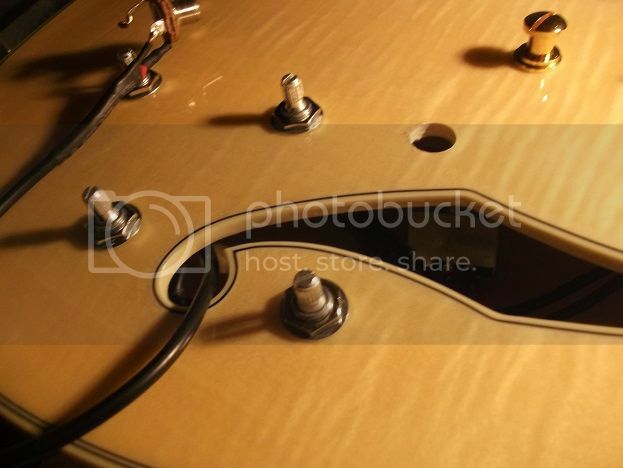 The first two shots are the diagram I made to work from - I need to have something that looks more or less like a physical representation of the shape of the overall wiring - and also the Ibanez wiring scheme I found on the web to use, which is basically the same as the stock wiring in my guitar anyhow. 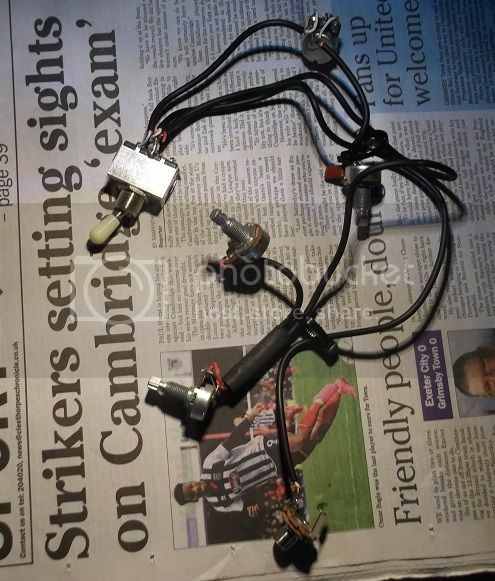 Then a pic of the wiring harness I've now made, which I finished today, and finally the old wiring just after I'd removed it, and was thinking what have I done, and other less polite phrases. I've used the stock 3 way toggle switch and jack for the new wiring. Also I've had to ream out the holes for the pots in the guitar to fit the CTS ones, which was a bit of a "should I be doing this?" kind of thing as well, but in the end I managed a pretty neat job just carefully using a decent round section file I have, and going slowly. All fascinating stuff anyhow, and more to come, you lucky people. You don't do things by half do you Megi. At what stage of the refit do you use the chainsaw? I know!, and of course they don't do anything different to any other capacitor. It's just that some time ago I bought a box of twenty 0.015uF paper-in-oil ex Russian military caps from a seller in Ukraine for about a tenner, and I still have loads of them left. 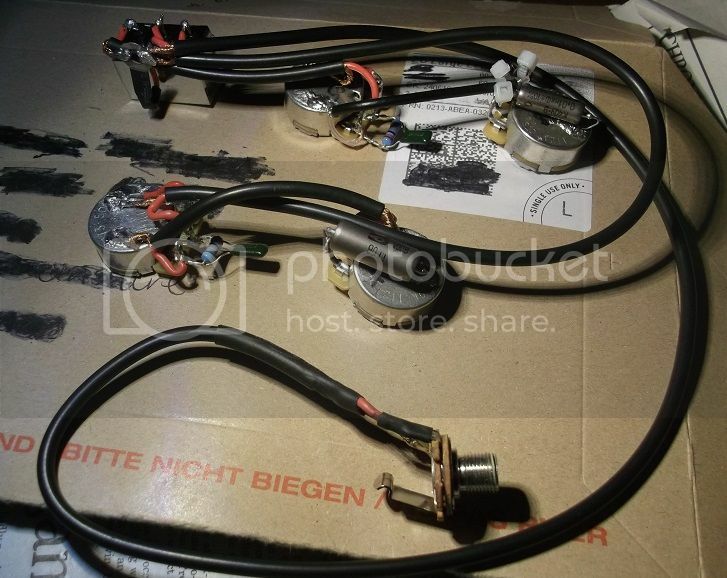 And also some time ago, I swapped five for some 0.01uF PIO caps of the same type/brand (with Hobbio on this forum IIRC) and I still had 3 of these unused. Anyhow - might as well use them. I've got them in most, if not all of my other guitars, and never had any problems, and they do seem very well made. Rewiring a semi acoustic is not for the faint hearted that's for sure. But I'm also sure you'll sail through it with your past experience, knowledge, and methodical approach. The finishing line of moving the guitar from good to excellent is a great incentive! I look forward to seeing the project unfold. I certainly appreciate your confidence and positivity, thanks Mark. Your right about the incentive - in fact I really love playing this guitar, so I have a strong drive to get it back in action ASAP. 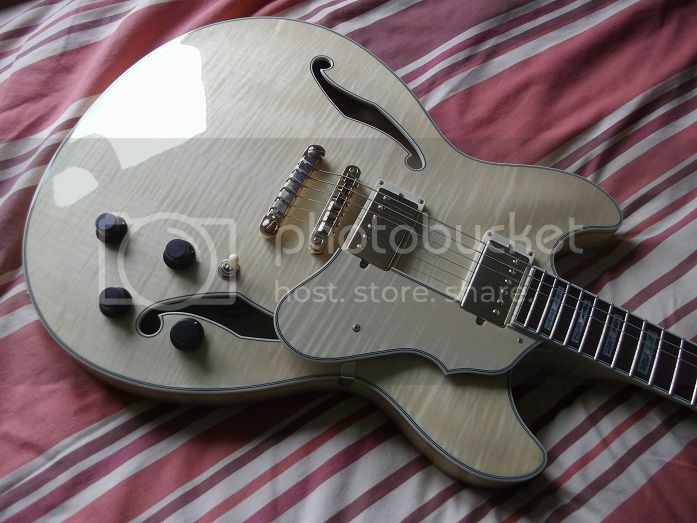 And a gig on Monday evening where it would really be nice to try the guitar with new pickups as well. Anyhow, we'll see if I can do it, but the plan is to have the job complete later today. I have just completed the installation of the new wiring, and testing with my multi-meter seems to show that everything is working. I feel drained, and a bit emotional frankly - it has been the job from hell, and yet I'm proud of myself for seeing it through. 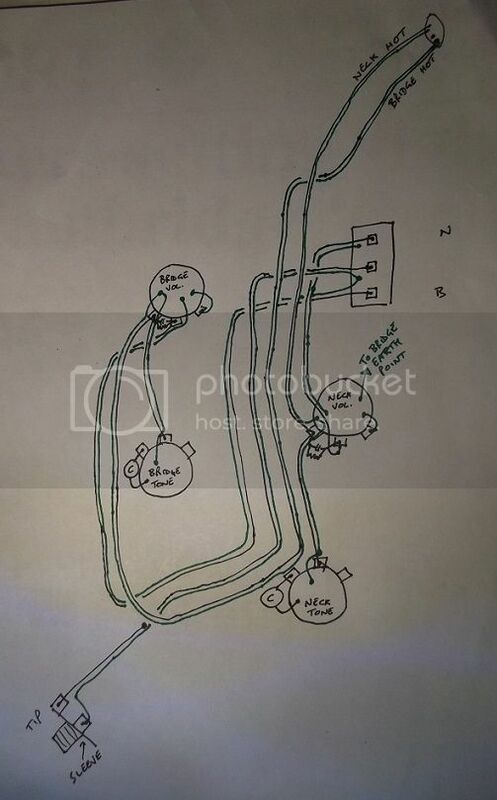 If anyone is thinking of having a crack at re-wiring a 335 style semi acoustic, my sincere advice is just don't - get some other expert-type person to do it, and pay them well, for they will deserve the money. I had better like these new pickups anyhow, because I'm not *&^%ing changing them again. I am in awe, looking at what you have done, Megi. 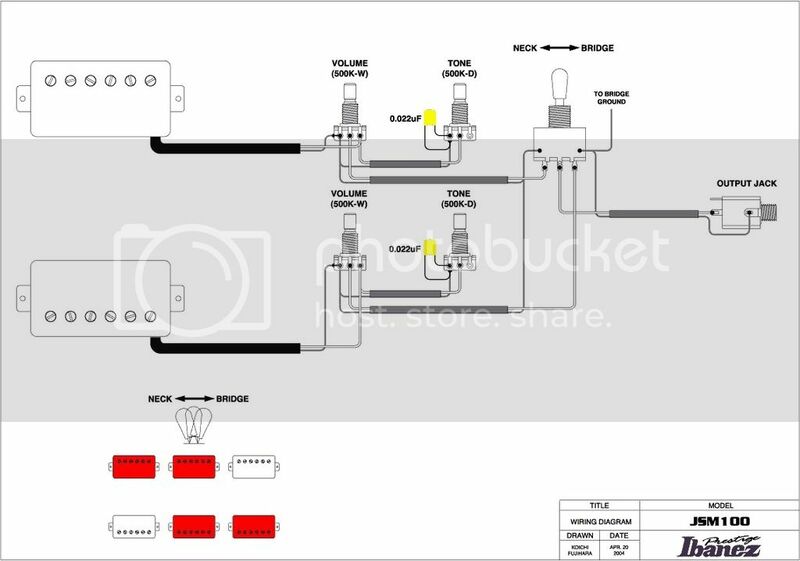 I would love to learn more about why you chose to change the pots, why the bigger ones, what is a parallel cap/resistor treble bleed and more. I trust your decision-making but I don't know enough to be able to understand why ou have done what you have, otehr than obviously to improve the sound. I'll try and answer as best I can Lester - probably the main reason I changed the pots was to be able to use log (aka audio) taper pots for the volume controls - as when these are fitted with the treble bleeds (which soften the pot taper a bit, in addition to there main function), they control the volume in a particular way I like i.e. in terms of how a certain amount of turn of the control causes a certain amount of volume decrease. A secondary reason for changing the pots is that the larger size CTS brand pots are very highly regarded for their quality of manufacture, and have a high reputation for reliability and durability. And I suppose a third reason is just that sometimes I actually find it easier to start fresh from scratch as it were, rather than trying to add to, or modify an existing circuit, which can be very finicky to do. What is a parallel capacitor/resistor treble bleed? 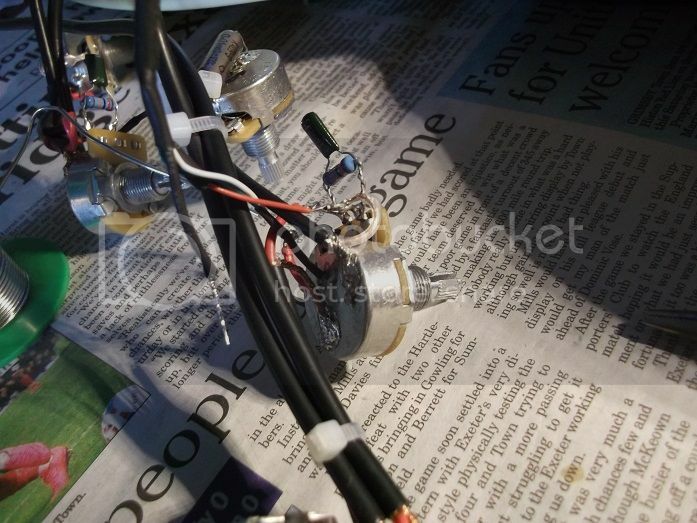 - it's a little circuit addition between two of the connections on a volume pot which counteracts the tendency for the sound to get duller as one turns down the volume. It does this by "leaking" a little extra treble frequencies across the terminals, hence the name. (I may not have this exactly right, but it's something like this basically). 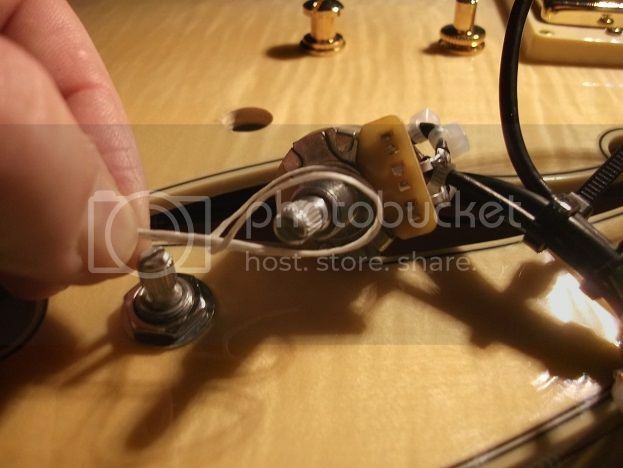 I freely admit I'm a bit of a fusspot control freak when it comes to pickups and guitar wiring. 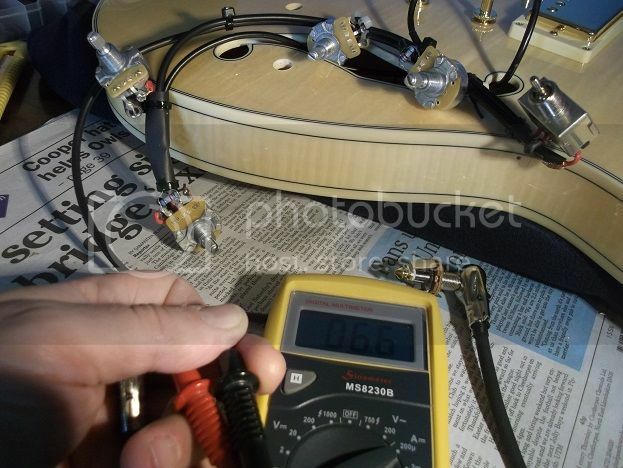 I like to have things a certain way, and exactly to my liking, and to be in control of all of the details of the circuit and components inside a guitar. A lot of people who are wiser than me just get on with using an instrument to make music, and don't bother with all this faffing about! Then some drunk will accidentally tip a pint of beer over it during your break. 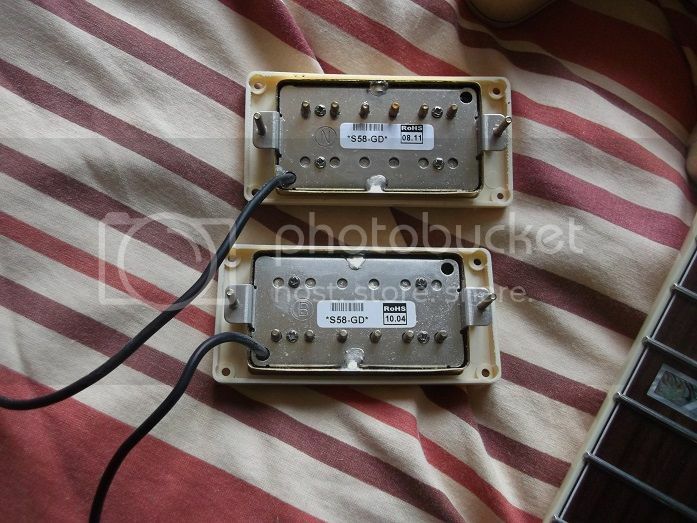 The old pickups, nothing really wrong with them, just not quite the sound I'm after - I would say a bit too much upper midrange, and not enough of the high/shimmery treble frequencies. Just showing the holes for the controls, including the widened pot holes to take the new CTS pots. So, guitar sans electronics, ready for the new stuff to be fitted - sadly not a ten minute job! 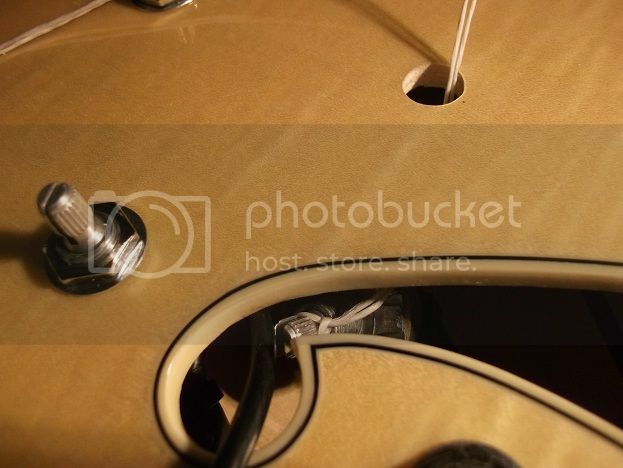 The wire coming out the f-hole connects to one of the stop tailpiece posts, to earth the strings - it will be connected to a suitable point on the new wiring harness. 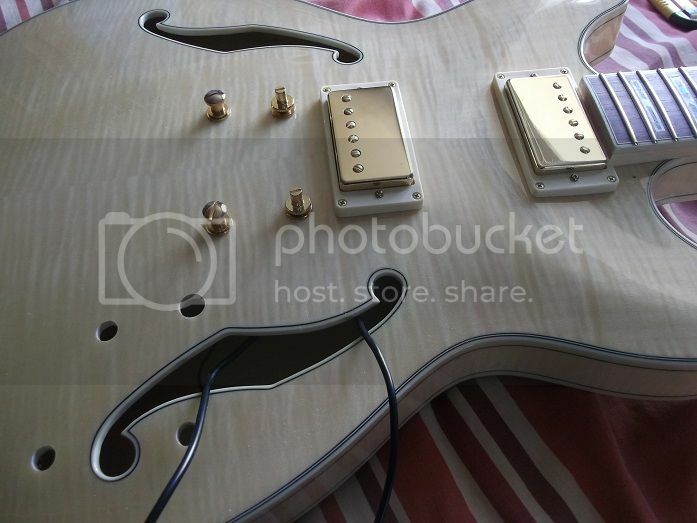 The new pickups fitted into the surrounds and installed - I did not shorten the connecting wires to these at all for this job. Soldering about to get underway - a useful trick of mine is the improvised mini pot-holding vice, using a pair of pliers and a hair band. 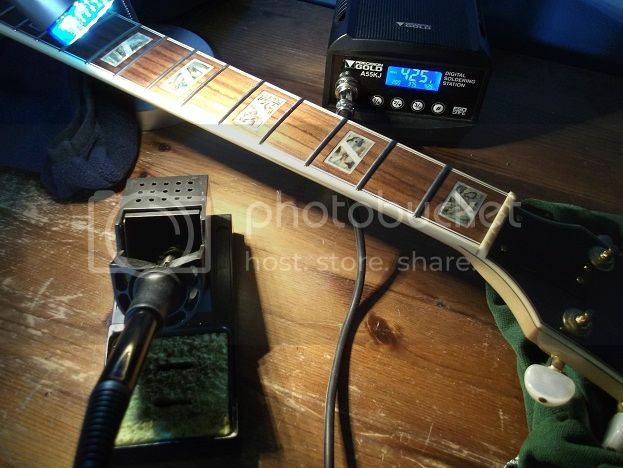 I've just connected the red (hot) wire from the neck pickup to it's spot on the neck volume pot, and about to connect the black earth and signal return wires to the back of the pot. 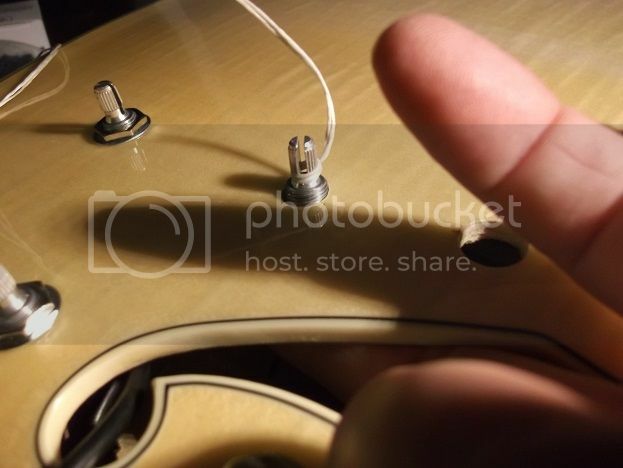 The wires from the bridge pickup have been connected to the bridge volume pot, and then the last connection to make is the wire that goes to the stop tailpiece stud to earth the strings - I've connected this to a lug coming off the 3-way toggle switch. I used this lug to make life easier, as the connection point on the switch itself was just to small to accommodate all the wires it needed to. My lovely new soldering station setup, which I got as I plan to make some effects pedal kits up, but it was nice to use for this job also. 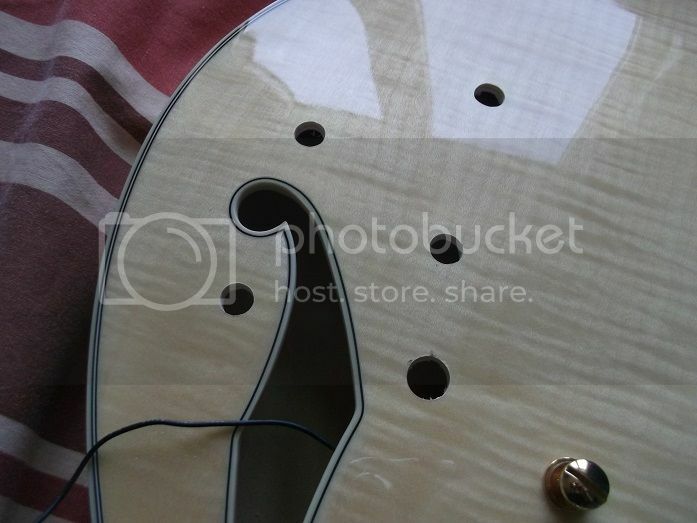 Just to follow a bit of the process - we pick things up at a point where I've got the bridge volume and tone pots in place, and about to go for the hardest one, which is the neck tone pot - the hole is the farthest from the f-hole. I start by feeding in a length of doubled twine through the pot hole (I'm using archery bowstring material, but dental floss would work similarly). Bring the twine out through the f-hole, and loop round the pot shaft. One must make sure the twine takes the right route over/under any other wires in the way, otherwise it's not possible to get things positioned right inside the guitar (I made this mistake a couple of times, it's harder that it might look). Et voila! What could be simpler? (It may look simple - it wasn't ). I believe it was shortly after this point that I noticed a red wire hanging off the neck volume pot, in a way it shouldn't, and had to do a tricky bit of soldering work through the f-hole to reattach it. 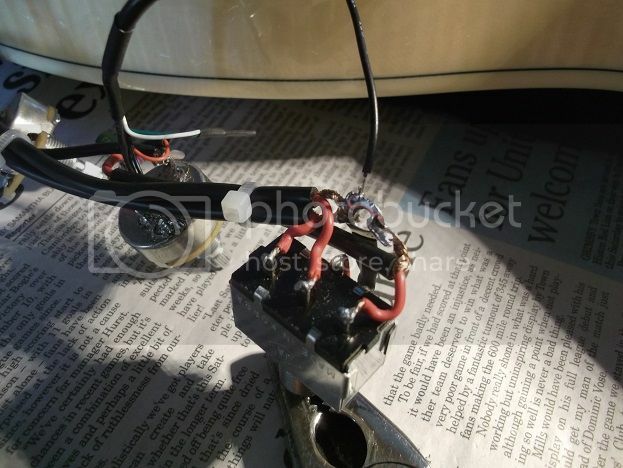 It's incredibly easy for this to happen with the fine wires from the pickups - I did my best to have these attached in a way where they were not put under any strain, but still had trouble - so that may easily have accounted for another half hour or more of time. Didn't take any pictures of this, but just to record it honestly. This pot now brought into position - much easier when one can get a finger in through the f-hole to assist - I am not making a rude gesture I promise. All the pots fitted, and I'm now about to get the 3 way toggle in place. ...except I wasn't - for some reason, at this point I decided to re-test the wiring again with the multimeter, and this time something showed wrong with the bridge pot/pickup side - it turned out to be the signal return wire had detached from the back of the pot - snapped near the connection, probably as a result of being knocked or pulled during installation. Again, I point out I'd done my best to wire things well and in a way that avoided strain on delicate wires - again, it wasn't good enough. This one was a real sod (I choose my words carefully) anyhow, as fixing it entailed pushing most of the just-installed pots back into the body so I could get at the bridge vol pot through the f-hole to re-solder. I had to lengthen the wire from the point where it had snapped, and then attach the lengthened wire to the back of the volume pot, all working through the f-hole. A *&^%$ of a job, but somehow got it done, yay! And hooray, the completed and restrung guitar this morning, all still appears working fine, and at some point soon I'll have to see what the new pickups sound like - unfortunately have to go out for a while, but as soon as I get back. Perhaps I'll feel differently in a while, but at the moment I plan to never re-wire a 335 style semi-acoustic again. A beautiful job. I have thought about doing similar to my Aria TA-50 but never had the bottle. Thanks Jocko - it certainly feels beautiful that it's over and I've got the guitar working and playing again. I honestly do question my wisdom in doing the job at all though - I guess it's alls well that ends well, but still. I'd say if your Aria TA-50 plays nice, and sounds nice, and all the electronics works fine, then leave well alone! I have to raise my hat to the people in guitar factories who can wire dozens of these things in a day, I don't know how they do it. They have the tools designed for the job. Great job! Your experience, knowledge and methodical approach got you through it. The fact that even with all those qualities it was still tricky and left you feeling the way it did does underline what a difficult job this is with a semi-acoustic. As for remedial soldering through the f-hole .... steady hand and nerves of steel!!! 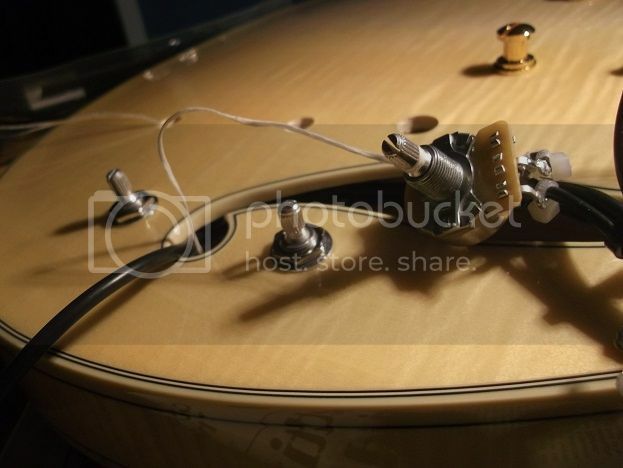 I remember when it came to changing pickups in my Hagstrom Viking Deluxe it took very little research to convince me to get an expert to do the job. The fact that my soldering (lack of) skills leave the possibility of damaged pickups made it a no-brainer with the cost of those Duncan Lovers. I do hope the sounds you are now getting are good. Well done, I remember the trepidation of tackling the pots in my 335. I studied lots of yootoob vids and worked out the technique. Still had to do it twice to get it right! But having done it once(twice actually) the second pull through was fast and slick so I would do it again if I had to. There is just something comforting about having a guitar you adapted to you. Enjoy it in good health. Yes, I guess that is a lot of it, plus they will have things down to a slick process, maybe with one production line making the wiring harness, and then another team installing everything. Steady hand and nerves of steel is correct Mark! I did also take the precaution of protecting the surrounding body of the guitar with thick cardboard - it would have been all too easy to drop a blob of solder on there, and that would have been pretty unbearable. Doesn't bear thinking about - I cringe just saying it. Yeah you're right there ES - it's a tough job, but having done it the once now, and having had time to digest things, I do think I'd find it easier if I ever had reason to do it again. And the new pickups are sounding lovely (and surprisingly different to the stock ones) and the new pots and treble bleeds are working as planned, and it is very nice to have the guitar just how I like things. I did a couple of gigs (afternoon and evening) with it yesterday, and just got a call to dep at a big band rehearsal this evening, so am enjoying these opportunities to test the setup in a real-world situation. It is going to take me a while to get used to the new guitar and the new pickups, but I think it's good. People (musicians and audience) were telling me what a lovely sound the new guitar has yesterday, so that has to bode well. Good job and very educating posts, Megi! Thanks Roman - it's an awful thing to say, but I'm not at the moment sure if I like the new neck pickup. 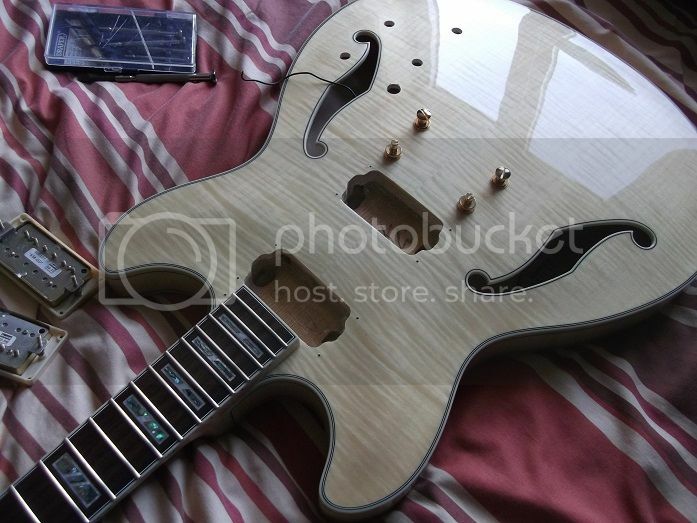 I rush to add that have no complaints at all about the quality of Ben Fletcher's work, and I got exactly what I asked for, but possibly I'm finding the pickup just a bit under-powered and lacking body for my taste. It is a brilliant pickup for translating the woody acoustic nature of the guitar, and really lovely for getting an archtop jazz guitar type tone - I think a lot of people just hearing the guitar would be fooled into thinking it is a full hollow body archtop. But somehow I think perhaps I'd be better with something a bit fuller sounding, and with a bit more attack - maybe more of an "all-rounder" in pickup terms. I'll give things a bit longer though, and see what I think after more experience using the guitar. Megi, somehow I am sure Ben Fletcher will appreciate this feedback and will be able to adjust and produce exactly what you need. Have you posted any soundclips? HAHAHA...ahem... Ain't life just like that? LOL I'm not laughing at your potential misfortune, Megi, but rather at it probably happening to me. Except I'm more likely to be the one spilling something or doing something just as stupid! Good for you for trying this. And it looks like you're doing the best thing in the circumstances - getting back on the horse! Cheers Roman - I'm sure Ben could easily make something adjusted to better get at what I'm after, and maybe I'll talk to him again at some point. But first of all, I need to figure out exactly what it is that I am after I have to say again that Ben is not at all at fault - he made the exact pickup I asked for, and thought I wanted, and did a fine job of it. The stock pickups on the guitar had some pluses but weren't quite right, and now these new pickups also have some strong pluses, but again may not be quite right. Really, I'm talking here about the neck pickup - I would say the stock neck pickup had a good fullness and strong, strident tone, but was also too biting and aggressive, with a lot of upper mid frequencies, and I found it hard to eq things on the amp. By comparison, the new pickup (low wind 6.6K alnico 3 magnet) makes the guitar much more acoustic-ish in tone, if I can use that analogy - there is an overall softer, more natural feel to things, and the woody acoustic qualities of the guitar come through a lot more. But at the same time, the attack and sustain/decay of a note is also more like that of an acoustic, and I'm finding that for soloing stuff with bands, the notes don't seem to hold and "sing" as well as they might. I find myself plucking the string harder than I normally would to get the sound to cut through, but that then produces an effect where I hear too much of the initial note attack, and then not enough sustained tone afterwards. So yes - more like an acoustic guitar, which is not a bad thing in itself, and that does have some nice aspects - it's great for jazz rhythm playing for one thing. But perhaps this experience also teaches me that I am primarily an electric guitar player, and need to have certain typical aspects of an electric guitar sound happening to work at my best. It's all a learning curve! People are usually fairly well behaved at jazz gigs, so hopefully I'll avoid the beer spill scenario! Who knows though? - anything can happen in life, but I prefer to live it to the full, and take such risks. And cheers - yes, at least I got back on the horse and finished the job, and in the end it all works fine. Plus I've learnt a fair bit in the process, and as ES Blonde says, I'd be better at it a second time. Re the Fletcher pickups, they are an alnico 3 magnet, wound to 6.6K in the neck position, so a pretty "low wind", and a 8K-ish unoriented alnico 5 magnet in the bridge. Ben Fletcher felt that unoriented alnico 5 would give me a tone not unlike alnico 2, but with more power - I haven't used the bridge pickup much yet, but this does indeed seem to be true. I think a nice thing about buying from Ben Fletcher is that he's very happy and enthusiastic to discuss the kind of sound you like as much as you need, and what might best suit you, and as a result, you end up with something unique and tailor made. OK in this instance, I may have asked for not quite the right thing for the neck pickup (the jury's still out on that), but still it's a great buying experience. For the previous set of pickups I bought from Ben for one of my Shine guitars, the discussion led to some pickups that I totally love - I'm still amazed at how great those sound, and how much they suit me and the guitar. UPDATE - the pickups are just fine, in fact they're lovely. To explain, I had stupidly not experimented at all with pickup height, but yesterday finally did. Raised the pickups a tad, and took the guitar to my regular Thursday evening jazz gig. And it sounded great - better than great even - suddenly all the sustain and body to the tone I could want was there, along with the guitar's woody acoustic quality. The tonal balance is right where I wanted it to be as well, meaning I can have the amp eq'd in the same area as my other "jazz guitars" i.e. the Shine SIL-510's and Ibanez JP20 archtop. This is a definite improvement over the stock pickups, which to me had a bit of a brash quality, as well as lacking high-end sparkle at the same time. At the gig we did a few latin numbers, and just with a clean tone I thought I was getting a bit of a Santana-esque vibe (obviously I don't compare myself!) so no lack of sustain there. So - pickup height - it can be important. I think with my initial eye-balled setup, I had the pickups too low, and my theory is that like this, the pickup "sees" a disproportionate amount of the initial attack when there is a lot of string vibration, but the longer sustain of the string, when the amplitude is less, doesn't get picked up enough. So I perceive a seeming lack of sustain. With the pickup closer, it's able to see the full story of the string vibration much better. Actually, I'd say I may have had the pickups just a tad closer than they need to be last night, so I'm going to experiment and get things just right. I reckon there is a sweet spot - too low and you get a tone that has good detail and a nice open/airy sound, but lacking body and sustain. Too close, and the tone can become a bit bloomy and overly bassy, and lacking some detail. But get things just right, and you have the best of all worlds. None of this is news to a lot of you I'm sure, and I've read such advice before, but for some reason (stupidity probably!) 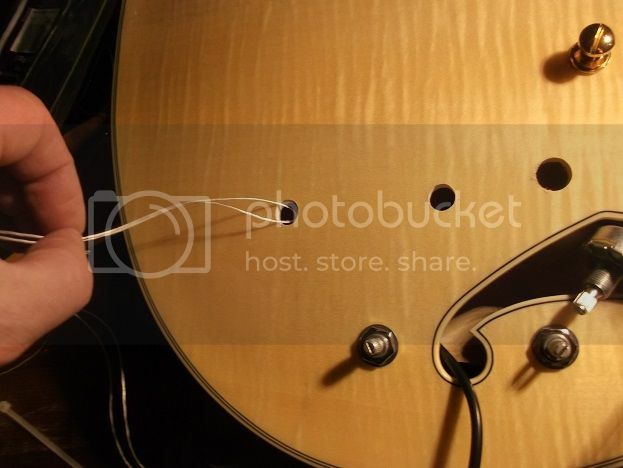 it took me a while to twig with this guitar. 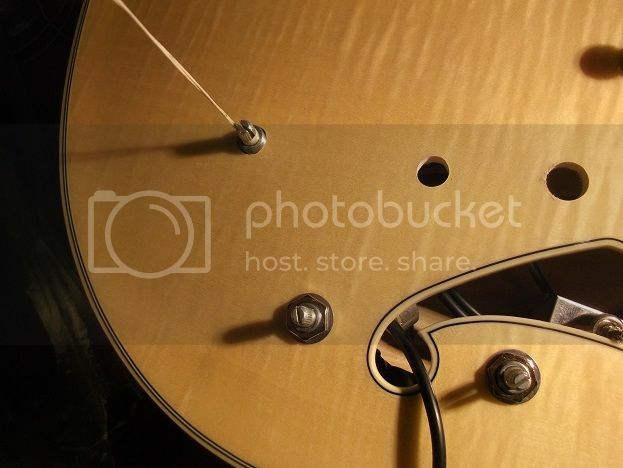 On the lespaulforum there is a thread about getting the sweet spot. They talk of bloom, essentially set the PU low and pick a note listening for the decay. Raise the PU a turn (or half) and repeat. At the point where the note starts to decay but then seems to come back is called the sweet spot, get higher or lower and you lose it again. It might be worth trying (but memorise the current height if it's about right anyway). It worked on my 335 and others claim results on other 'G' guitars so it might be worth a go, beware some people claim it's smoke an mirrors so may be it's in the imagination or only works on some specific instruments. Interesting, I'll bear that in mind ES. I'm not really sure if I want the decay then bloom effect myself really - I think I do like to have a good amount of sustain though, which is one reason I'm attracted to semi-acoustic guitars for jazz, as opposed to full-hollow archtops. But I'm sure there is something in what the LP forum say, and my own experience does seem to show that whatever the result one is after, pickup height is well worth playing with.